The company continues that there is also a need for enclosures that are based on a uniform system platform to suit various applications. Rittal says it has “docked” its SE 8 enclosure system to its’ existing TS 8 platform, which now offers the same configuration options as traditional baying systems. 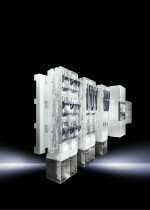 Rittal says users are no longer forced to fall back on an enclosure system different from baying suites when preferring to use free-standing enclosures as stand-alone solutions.